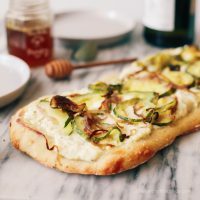 This quick and easy oven roasted zucchini flatbread recipe is perfect for a meatless dinner or easy appetizer. Give it a try this week! One of my all-time favorite foods is PIZZA. My addiction is really bad…so bad that we have pizza every Sunday night, just so I won’t be tempted to eat it every day of the week! 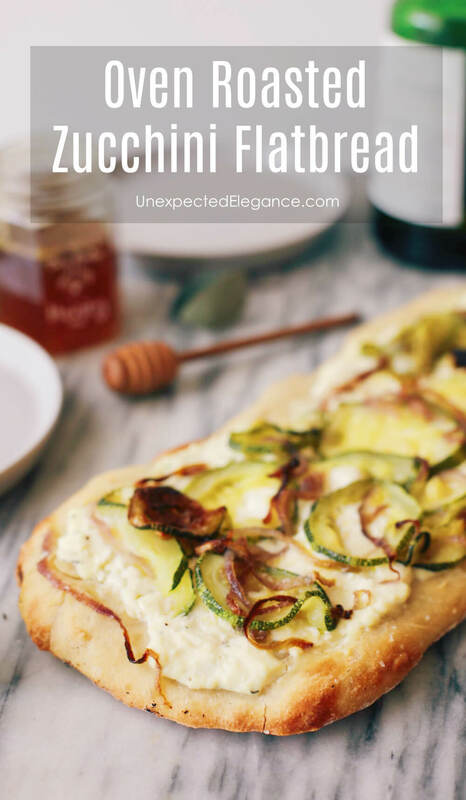 This oven roasted zucchini flatbread recipe is great for a meatless dinner with a fresh salad or even an appetizer. If you’re like me and you like to eat leftovers, this can make a quick meal. 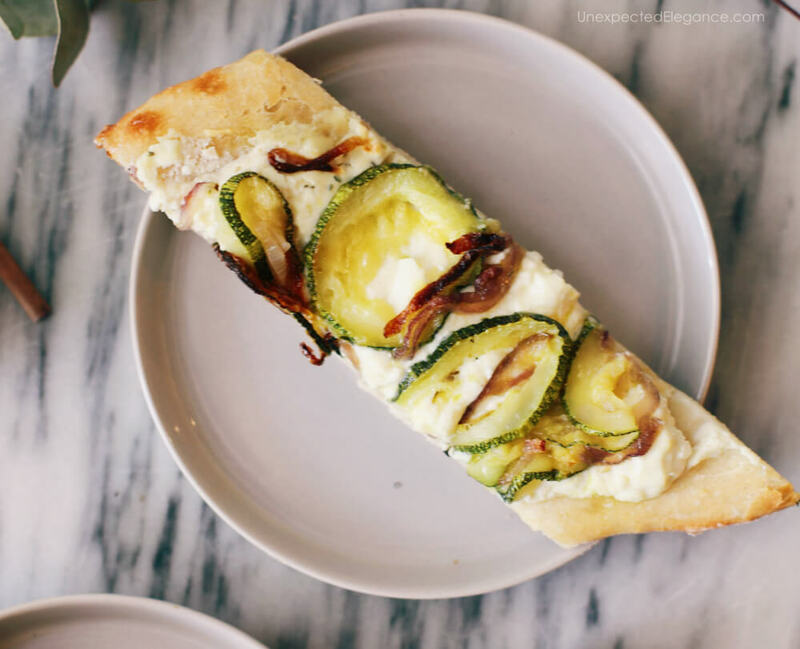 Just don’t cook the crust until you’re ready to eat it. The dough will last for 2 days in the refrigerator and you can store the oven roasted veggies in an airtight container for up to 3 days. In a bowl combine the water with the honey and salt. Add the active dry yeast and the flour. With the help of your hands or with the hook attachment. Mix the flour with the water. Add the olive oil and continue kneading until you have a smooth ball. Cover and let rise for 40 minutes. Meanwhile oven roast the veggies. Preheat the oven to 350 degrees. in a bowl mix the zucchini and red onion with the olive oil, salt and pepper. Place on a. baking sheet and put in the oven for 30 minutes or until slightly golden. In a food processor combine the rest of the ingredients. Once the dough is done, place it in the center of a large baking sheet and spread to make a crust. 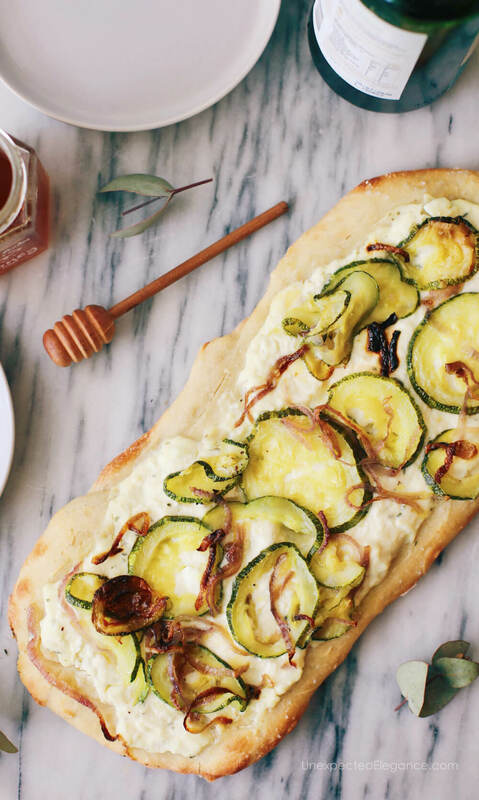 Cover with the ricotta mix and the caramelized zucchini and onion. You can find more quick and easy recipes here!